Amanda Brasfield and Drew Stutts were married June 16, 2018 in a 6:00 evening ceremony at Creekside Plantation in Mooresville with Jeff Cruse officiating. An outdoor reception followed in the vineyard of Creekside Plantation. The bride is the daughter of Janie Brasfield and Mike Ganus, both of Savannah, Tenn. She is the granddaughter of Joyce Brasfield Chandler of Mifflin, Tenn., the late Paul Brasfield, and the late Evan “Hoss” and Rose Ganus. The groom is the son of Randy and Kim Stutts of Lexington. He is the grandson of Pat and Jane White of Lexington and Harold Stutts and the late Betty Stutts of Greenhill. 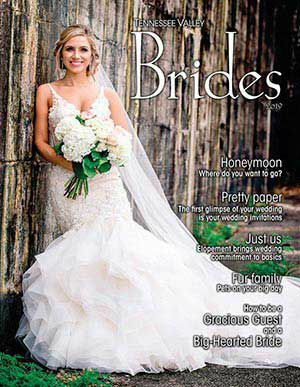 The bride wore a beautiful white lace strapless gown with matching veil from Kathleen’s Bridal. Maid of honor was Gabrielle Kroeger and matron of honor was Shelby Pruitt, both friends of the bride. Bridesmaids were Brittany Brooks, Hailee Gallaway, Nicole Cumbo, Erica Martin, Hanna Hardy, and Sam Parrish, all friends of the bride. Flower girl was Addison Ritter, family friend. Best man was Kenny Ratliff, friend of the groom. Groomsmen were Randy Stutts, father of the groom; Darrell Dye, Andrew Howard, Hunter Roberson, Hunter Killen, Luke Brackin, Josh Doyle, all friends of the groom. Junior groomsman was Bryar Knox, nephew of the groom and ring bearer was Kelton Ritter. Wedding director was Janet Waggoner. Floral designer was Weddings by Jeannie/ Nip & Tuck Florist. Caterer was Jill’s Sweet Memories and the wedding and groom’s cakes were made by Lauren Thomas. Music for the ceremony and reception was provided by Sweet Tree Productions. Hair stylist was Whitney Weeks of Parlor 217 and make-up artist was Makeup by Corey. Photographer was Leah Grace Photog- raphy and videographer was Awaken Films. Drew proposed with our sweet golden retriever, Summitt. After the ceremony, Sum- mitt ran down the aisle to us and lead us out as we made our exit. She was our special “dog of honor”. One moment that stands out was the very end of our vows. Being avid and passion- ate sports fans, we come from two VERY different fan bases. Drew is an Alabama fan. Amanda is a Tennessee fan. This rivalry runs so deep that we each ended our vows with “...I promise all these things...EXCEPT on the 3rd Saturday in October...Go Vols!/Roll Tide!” It was a funny, but memorable moment everyone enjoyed and that theme carried over to the reception including each school’s fight song being played, and a shaker send off. We chose not to do a first look, but found a way to turn it into a special moment where Drew’s mom used an old blue handkerchief from my dad to blindfold him to allow for a special moment talking and praying before the ceremony without breaking tradition. After a honeymoon at Sandals Montego Bay, Jamaica, the couple is now residing in Huntsville.